LANDOVER, Md. — This morning, The Post included a story that took note of the 48,115 fans last night’s Maryland Terrapins vs. Florida State Seminoles game, the highest of their season at Byrd Stadium in College Park. 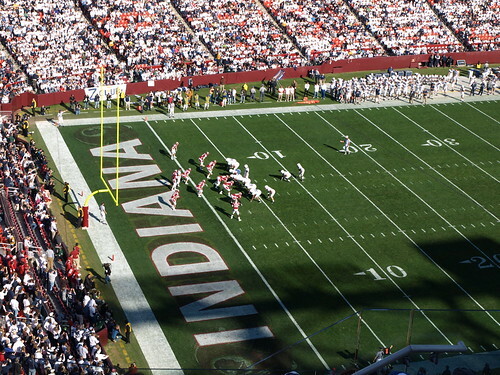 However, just down the Capital Beltway a few miles, 78,790 tickets were sold the Penn State Nittany Lions at the Indiana Hoosiers game that kicked off at noon. The Hoosiers sold what was a home game to Dan Snyder to play it at the home of the Washington Redskins for a reported $3 million. Depending on the source, Capital One Field at Byrd Stadium seats either 51,000 or 54,000 seats. FedEx Field has a capacity of 91,704. The Terps had a higher percentage of seats filled, but the Nittany Lions, oh wait the Hoosiers, had 30,000 more overall. As an on-campus stadium, Maryland has something of a captive audience with over 35,000 students. I do not not know if Maryland students still get to go to games for free or not. Tickets for Penn State at Indiana ranged from about $65 to $90 until they went onto Groupon when they started going for about half of those prices. Penn State has had several high profile players from the Washington D.C. area, including RB Evan Royster, LB Navarro Bowman, RB Tony Hunt, WRs Derrick Williams and Deon Butler, to name a few. Since Indiana was the home team, Penn State was not able to recruit. Maryland’s athletic department marketed the game against Florida State as a “blackout” dressing the team in all black and asking fans to do the same. The Terps have been enjoying a bit of a resurgence this year, entering the game with a 7-3 record and playing the top 25 team in Florida State. The Nittany Lions 2010 season has been their worst in six years and the Hoosiers were winless in the conference. Penn State beat Indiana 41-24. Florida State beat Maryland 30 -16. Good catch Will. On the drive home we got caught up in “University of Maryland event” traffic and when we got home I realized it was football traffic. I was curious about the attendance numbers and would have guess PSU-Indiana had more fans. Wonder how Maryland feels about that. Um, didn’t you expect the PSU game to outdraw the Terps? The Redskins specifically requested PSU for that very reason.